Cookie during a day trip up the Coast to Cameron’s Pub in Half Moon Bay. It’s a very English pub. While eating our bangers and mash, we parked next to the pub’s scenic red double decker buses! One of the sadder consequences (for me: perhaps not for anyone else!) 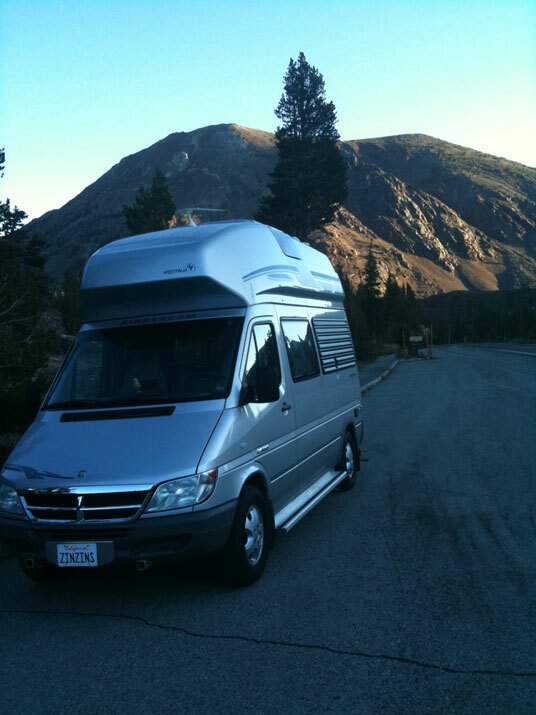 of the divorce was the forced sale of my amazing little RV, an Airstream adaptation of a Mercedes Westfalia motorhome, manufactured in Germany and adapted for Americans by Airstream. I prepared this blog post to help sell the RV on eBay. We have no choice. The divorce is pending, and we need to free up the cash. Plus the ex-missus hates Cookie, and calls it “Bismark” and other even less kind things. Now, of all times, we need to take steps in the right direction, the peacemaking direction. So Cookie is going on to eBay. As a backup to the eBay posting, to give background information as well as create a record for posterity, we are putting together this collection of photos and notes with a single and simple theme: what a great RV Cookie is! Another from the same trip up the Coast, this one taken by San Gregorio State Beach. Living in France in the late 1980s and early 1990s (we returned to the US in 1997), one particular RV caught my eye. Called a “camping car” in France, which is not that inaccurate when you think about it, the local RVs often miss the mark. But this one featured a Westfalia conversion of a small Mercedes diesel truck, a D207 if I remember correctly. 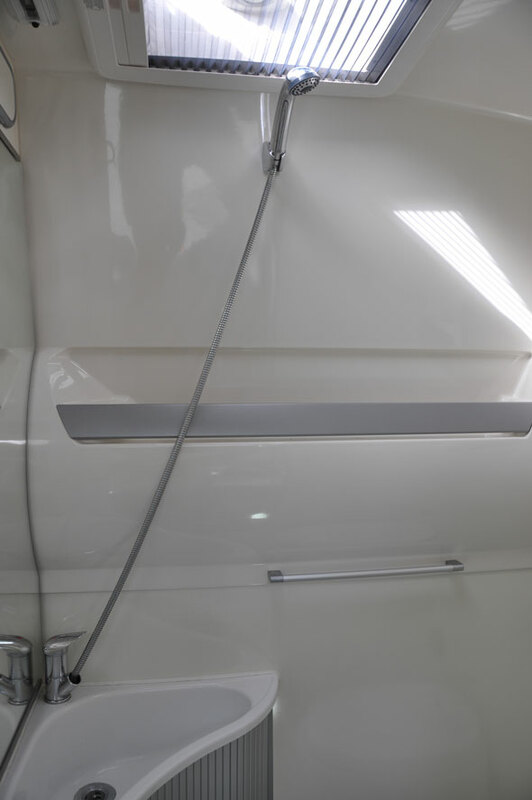 One of the extras that Airstream added to the basic German RV was a roof air conditioner, seen above the bathroom door here. It works off shore power, the propane-fueled generator (also added by Airstream) that is mounted under the floor of the rear of the van or, and this is neat, off the engine. I like the lights too, which can be switched to turn on when the side door is open. It was called a “James Cook,” and featured a high ceiling (I’m not particularly tall, but can’t stand to need to hunch over in a van conversion) and an overall feeling of space way in excess of its size. The clean lines of the interior made it easy on the eyes without being fancy. Very practical, it seemed to me, with two double beds for a family of four. Another difference from the European version was the black water tank. It’s a cassette in the James Cook, which slides in and out of the large panel in the photo, which is the rear wall of the bathroom. Airstream decided that Americans would need a black water tank, and installed it behind the hose in this photo. I could see it either way. The tank does take up some of the storage space in the European version. The James Cook was pretty much 100% German. You’re beginning to see why my ex came up with Bismark: something tall and German. Was Bismark tall? Things did not work out to buy one in France, but the James Cook’s clean lines stuck with me and became the baseline against which other Class B motor homes were measured when I checked them out in the US. Cut to around 2007, when I discovered the Airstream Westfalias. They looked a lot like the James Cooks, quite simply because they were upgraded James Cooks. 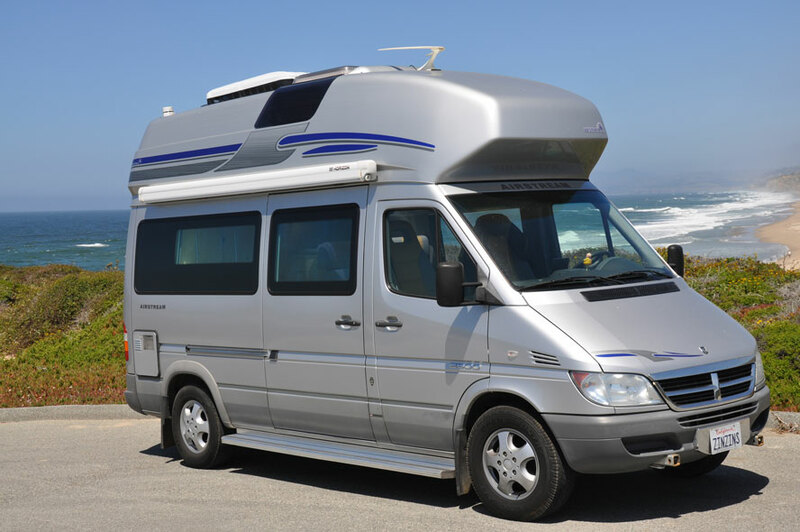 Mercedes built the chassis in Germany, and Westfalia converted it in Germany into a James Cook. Then Airstream imported them and added the comforts that they felt Americans would appreciate, and the Airstream Westfalia was born. Here is one of the windows with those dual screens. It’s on the driver’s side in front of the bench and behind the driver’s seat. Of course, normally you’d use one screen or the other (or none). This photo shows you how well integrated the two screens are around and in the window. The mosquito screen slides down, and the night screen slides up, into the frame. Each is effectively invisible when not in use. It took me a while to get one, of course. They retailed new for around $85K, and were so rare that the value did not drop very quickly at all. But by the summer of 2009 I had decided to make the plunge, and found and bought Cookie. All hell broke loose on the home front, but that’s another story, well almost. The ex put hundreds of excess miles on her leased car duplicating my trips in Cookie so that she would never put her foot in the RV. She never did, and is proud of that. Cookie’s best assets are only revealed by driving and camping. Skis. Not an unusual item to be transported on a winter trip. Storage tends to be a problem, unless you have a roof rack. Cookie’s ski storage is easy, an underfloor cupboard that goes from the rear door underneath the bathroom to the side door. This is the front of this long cupboard, under the kitchen floor. Its door on the right points toward the camera. The curving cupboard on the left above the floor contains the small safe. Windows. Let’s look at the windows. 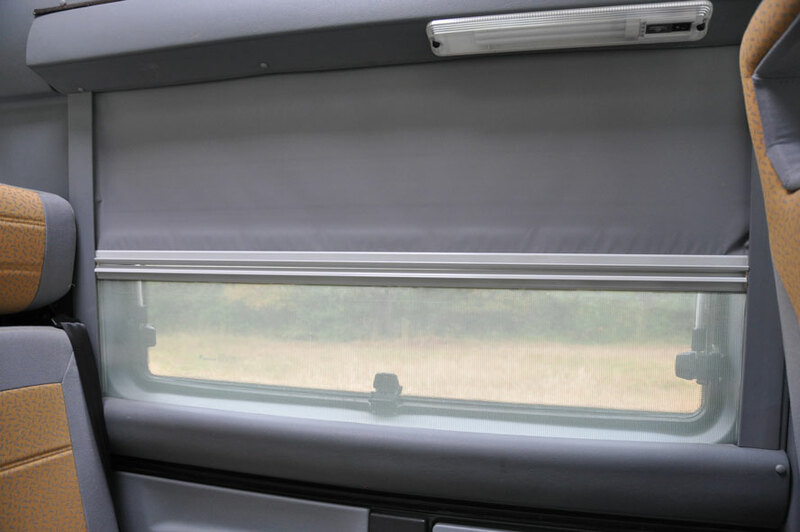 Not a particularly sensitive area of the vehicle, but if you’ve ever slept in an RV you’ve probably discovered that the drapes or screens let in a lot of light in the morning. Or that you can’t open the windows because the bugs will get in. One morning in Yosemite, it was 21 F in the sun!! Inside, it was toasty. Each side window and large main cabin skylight has a built-in mosquito net and dark blind (the bathroom skylight has only the mosquito net, because the light doesn’t penetrate the living area when the bathroom door is closed). You can see them both in the photo above on the left. During the day, if you want the window open (not when you’re driving!! ), you pull the mosquito netting across. For sleep, you pull the dark blind the other way. The two snap together, or separate when you don’t want anything between you and the window or skylight. Very sensible engineering. Here’s the easily adaptable rear bench, seen from outside. Under the floor on the left is another storage space, currently occupied by a mat for cleaning skiboots on. Above the far window can be seen the black mesh holder for night time odds and ends for one of the people in the upper bed. 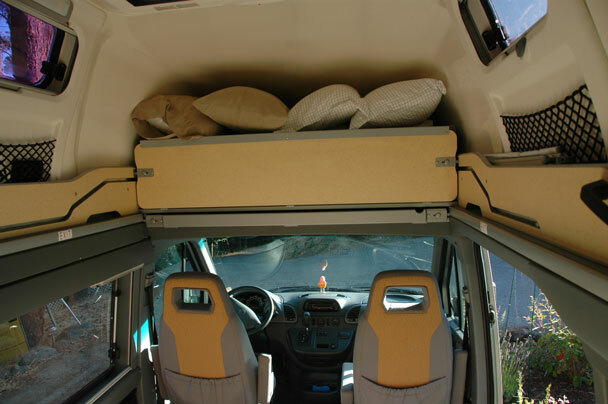 You can see above the window the track on which the upper bed slides into place. The dining table slides away under the upper bed when not in use. So the living space is only encumbered by the table when you’re eating. 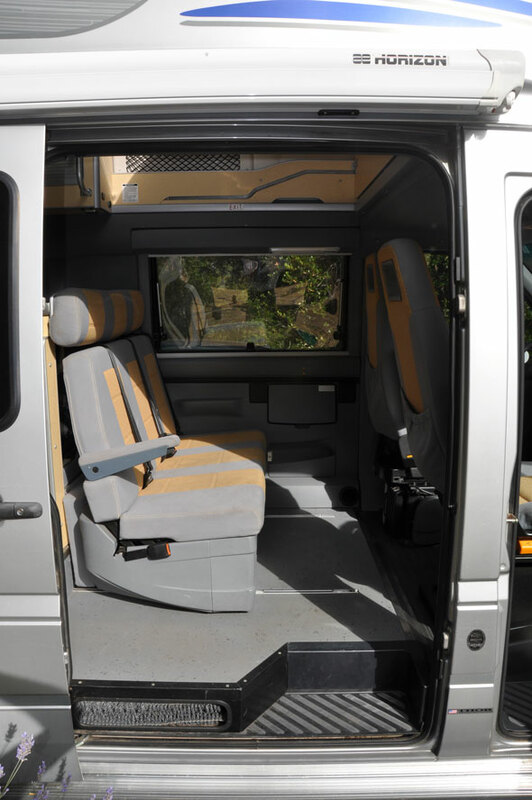 The driver and passenger seats turn around and move back facing the bench seat so that you can sit up to five at the table. Or there’s a small table that folds down under the driver’s side side window (below the window in the above photo) if you don’t need a full dining table, as well as cupholders. Here’s a view of the upper bed. The base of the mattress slides out on springs to the end of those tracks in the sidewalls. Winter heat is always an issue, that Cookie solves with a diesel coach heater that can be programmed on a timer and belts out hot air into the main coach and the bathroom. 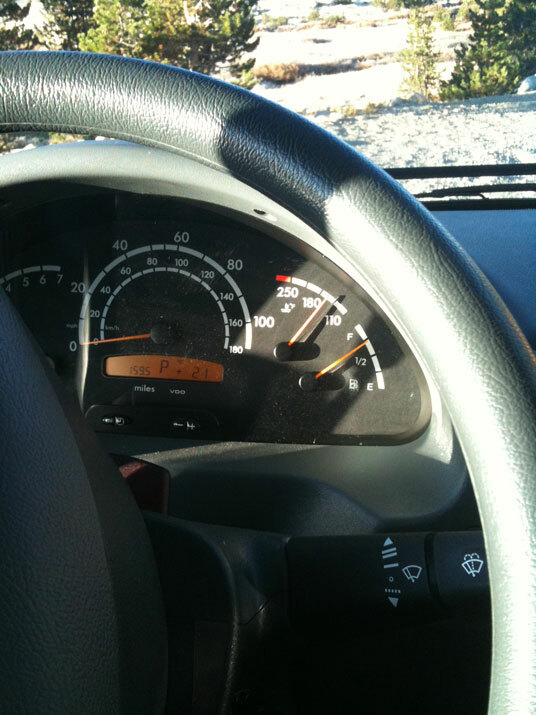 I made the mistake of parking on the side of the road in Toulomne Meadows in the high country on the Sierra Nevada late one September night when the temperature was 37 F. By the middle of the night, the temperature was 28 F and the pipes were frozen (no flush!). I put the diesel heater on, slept like a baby, and the heater had thawed out the pipes by the time I woke up in the morning. One of the heater vents is in the kitchen next to the water pipes. As I said, very sensible engineering. The prior owner installed this jack of all trades. My favorite use: with the iPod, as shown in this shot of its screen. Mine is actually an iPhone, and sometimes I need to control the music from the phone rather than from the screen. Either way, this puts out great music! The lower bed is really neatly put together. How does a full size double bed fit behind the driver and passenger seats, even when they are slid forward? 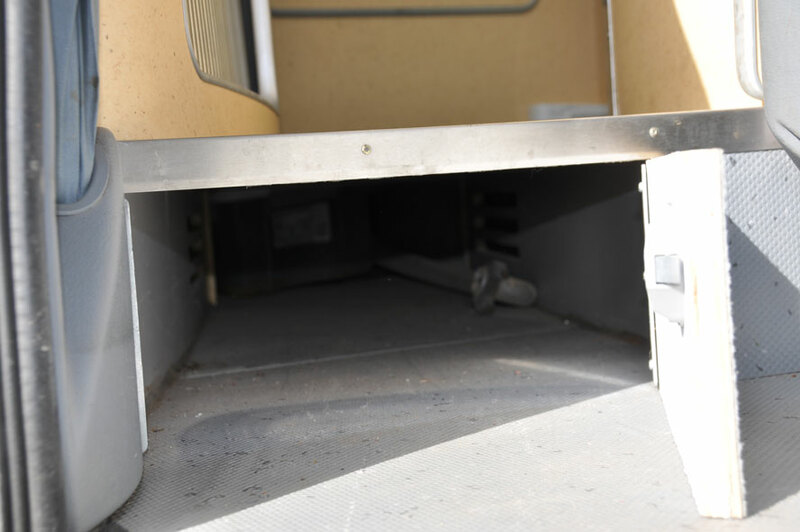 First, the rear bench slides forward using a lever in its front face and locks into the front of its tracks (visible on the ground in the photo above on the right). The seat back lays down flat behind the bench seat and level with it. An upholstered cushion then folds up behind the seat back and level with it. The base of the bed is one of the shelves in the kitchen cabinet. There’s a corner cut off, but that shelf is where I store the bedding. It all fits together so well! Plus there is a good-sized storage space under the bench. And it has three shoulder belts! Not forgetting the basics: comfortable seating with hard-wearing upholstery. The Kenwood in back-up camera mode. The orange-pink object is a buddha that came with Cookie and bounces around a lot. Cookie is a true family RV, pretty amazing for its length (it fits at a regular parking meter), and the two full-size beds beds confirm it. Because of the high ceiling, the upper bed is actually livable. You would not want to climb up there if you were very overweight, but if you’re normal (I’m a little over 6 foot, and around 190 lbs) it’s fine. You can move around up there to arrange the bedding, and the bed slides into place (and back out of the way) with almost no effort, giving you springs under the foam most of the length of the bed. 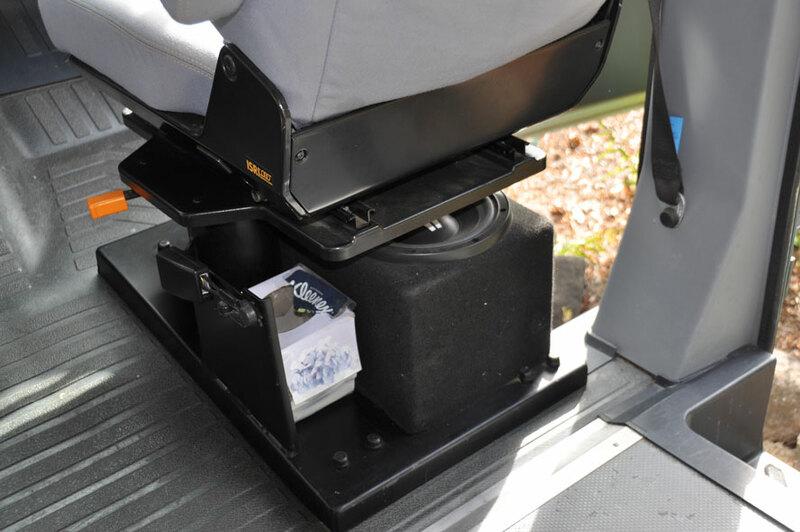 The amplifier mounted on the rear of the driver’s seat pedestal. Another net pulls up out of the head of the bed and attaches high on each wall. This comforts those, like my son’s girlfriend, who might otherwise be afraid that something (her head? her purse?) could fall off during the night. 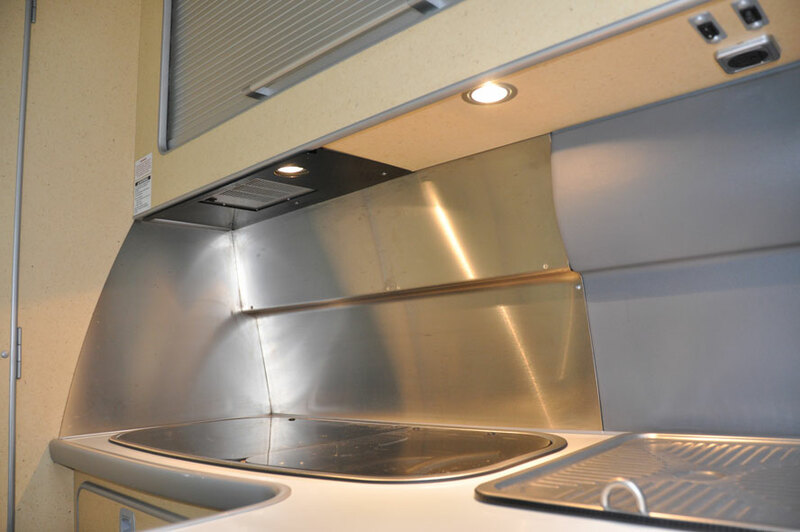 A couple of after-market options enhance what Airstream calls “our extensive experience in built-in livability.” I need music. Not complicated. The prior owner had a similar feeling, and did something about it. He installed three basic devices to amplify his listening pleasure. First on the list, a Kenwood gadget in the dashboard that does everything but cook toast. 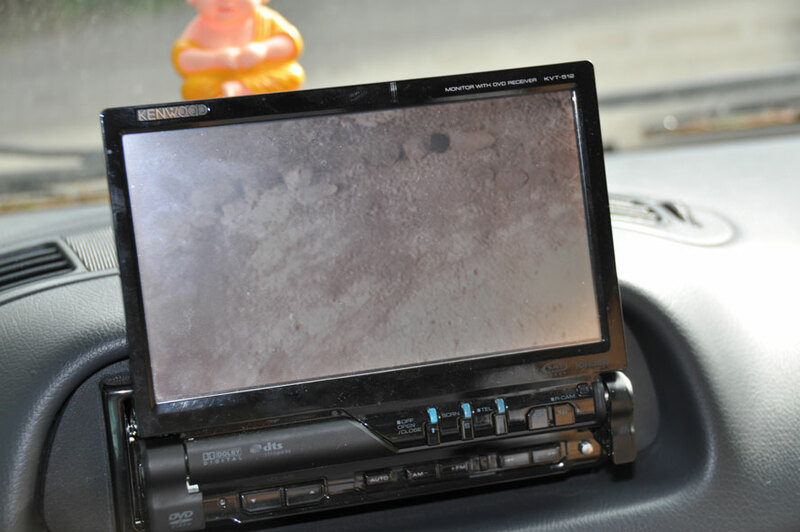 In reverse gear, it’s a back-up camera screen: only black and white, but very useful: there are not a lot of windows back there! In drive or park, it is a GPS and an audiophile’s dream, both of which are pretty useful. And fun!! The GPS can take you anywhere, pretty much. 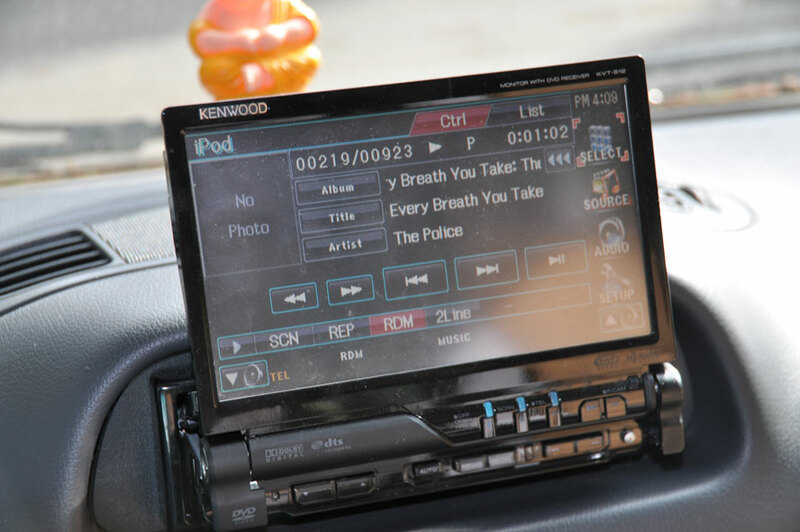 The audio can bring you satellite radio, if you subscribe, AM and FM radio, CD or DVD, and my favorite, the iPod, which plugs into a connection that charges the iPod in the glove compartment. The bike rack. It attaches to two hollow square tubes welded under the frame. Similar tubes are also welded at the rear. When attached to the rear, the trailer ball fits in the short tube in the middle. The black post can go on the left or right, depending on how you’re mounting the bike. There is also an equalizer, with a graphic on the screen which allows you to see what you’re doing as you focus the sound where you want it in the cabin. It says that it can adjust the rear bench relative to the driver’s and front passenger’s space My boys love to play with it: I can barely hear the difference! Of course, they do have musical ability. . .
Cookie comes with a built-in umbrella, the same color as the RV! It is strapped in place, logically enough, right next to the sliding door. Not as much as the other gadget that my predecessor installed. He was the proud owner of a motorbike, and did not like to be separated from it. So he had a rack for it custom built. He told me that he had designed it himself. It fits on the front or the rear. He said that weight distribution is better when it is mounted on the front, but that the bike can block the headlights at night, depending on the bike. Looking in from outside the door, The shower head extends from the sink to a bracket above te bar across the far wall. That bar is a built-in shelf holding shampoo and the like. 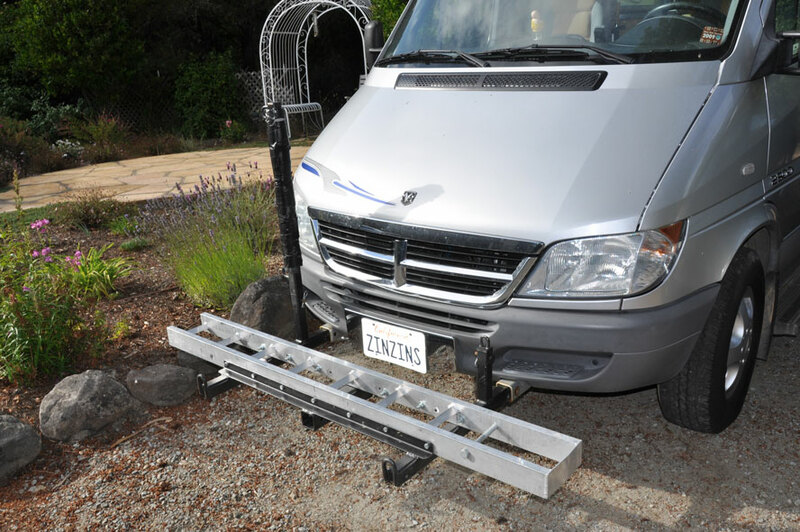 If mounted on the rear, the rack has its own built-in hitch for a trailer and thus permits towing a trailer even though Cookie’s own trailer hitch is blocked by the bike rack. He thought of everything! I have great respect for those remarkable individuals with mechanical aptitude. Perhaps I should take you on a tour through the bathroom and kitchen. There will be those for whom these are more important than Cookie’s amazing dashboard gadget and the motorbike rack. From a similar viewpoint, this time inside the door, with the shower head in place. Note the skylight with mosquito net covering the opening. The mirror is above the sink covering the left wall. 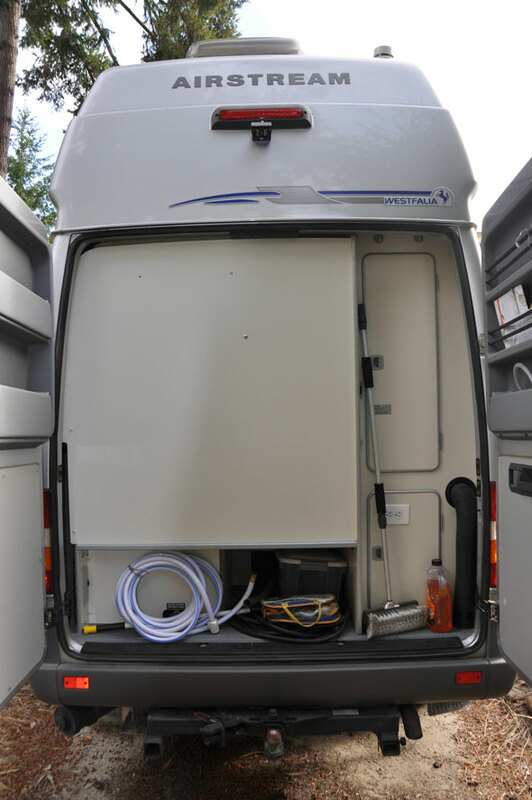 Starting with the bathroom, it is of course as compact as the rest of the vehicle, but with everything that ought to be there fitted in somehow. The photo on the left shows you the basics. The entire floor serves as the base of the shower, which drains at the bottom right of the picture just inside the door. The finish is bright, very clean and easy to clean. The kitchen is fully equipped, of course. 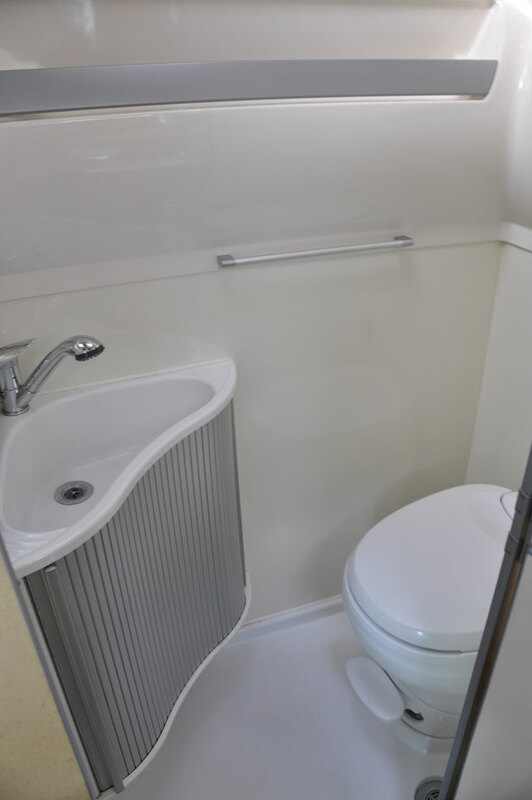 It is located behind the seating area and in front of the bathroom. 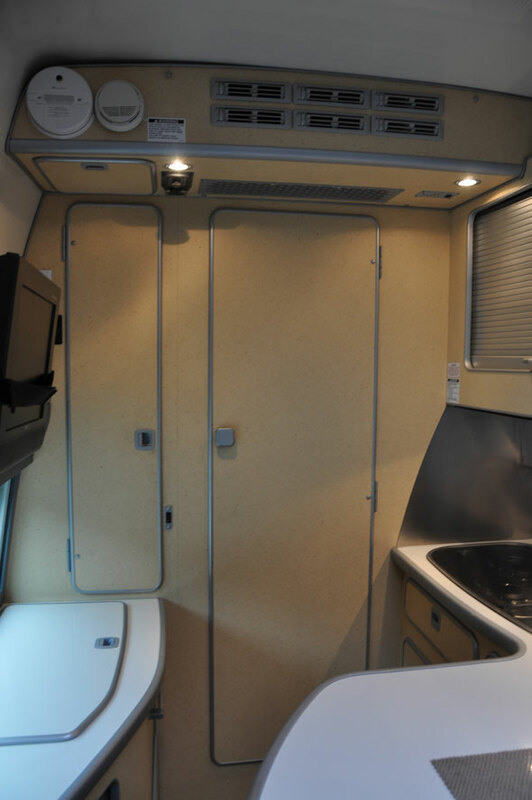 On the driver’s side behind the bench is an L-shaped counter with cupboards underneath (one of which serves as the bottom part of the lower double bed). The sink and stove top take up a good portion of this counter. The stove and sink have their own lighting. The surround is stainless steel.There is a cupboard above. Underneath the stove and the cutlery drawer hides the small microwave oven behind a folding door, as well as a space for garbage and cleaning products. 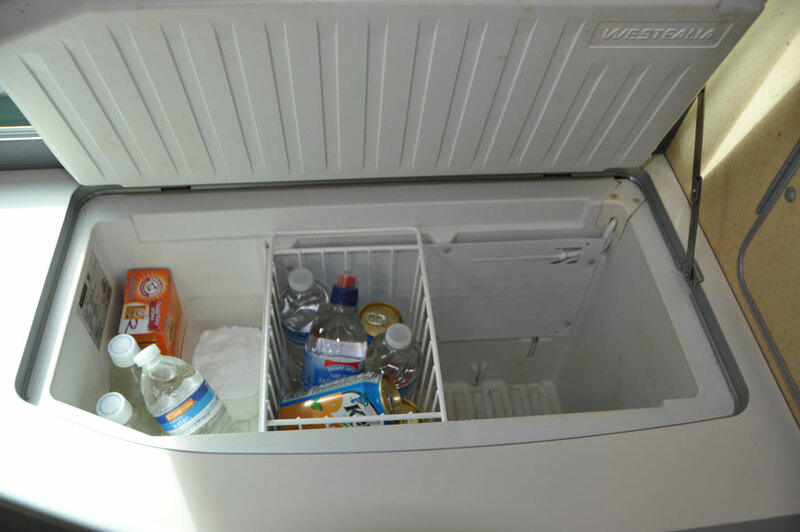 The fridge opens horizontally rather than vertically and is located in the opposite counter top. It works off the batteries, not propane. Looking into the open fridge. 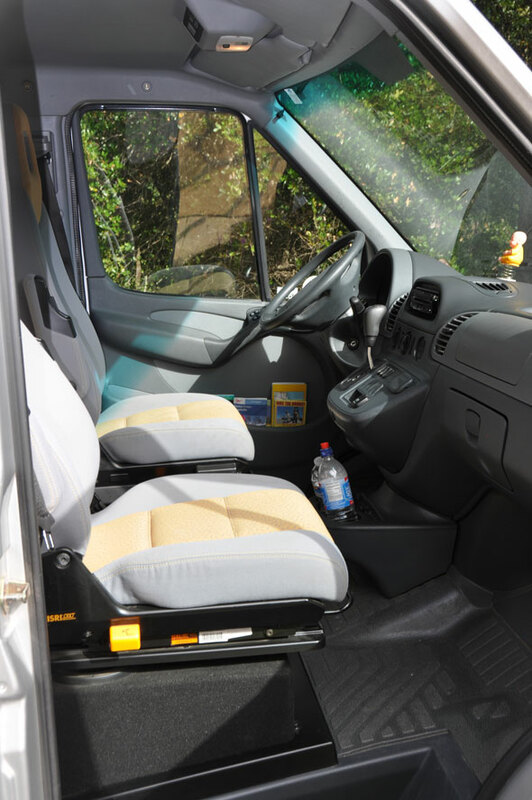 A view of the passenger seat and across to the driver’s seat. 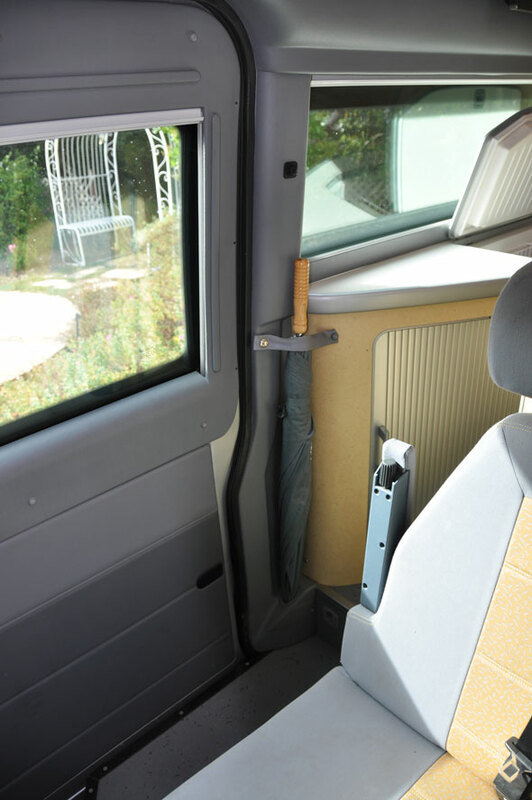 The seats are Westfalia’s and adjust in several different ways using the various orange levers, a couple of which you can see at the base of the passenger seat. Note The buddha on the dashboard. The Kenwood gadget has folded itself away into the dash. Nightfall, the attractive built-in lamps come to the fore. The generous sense of space and comfort make it easy for a couple or a family of four to feel at home. It is a quality compact “camping car,” with clean lines and contemporary styling. It turns heads wherever you go. People are always asking me to check it out. It is completely self-contained, if that’s what you want, but you can use trailer park hookups too. Let’s get back to what it’s all about, what a sensible and small but all-inclusive RV is all about. 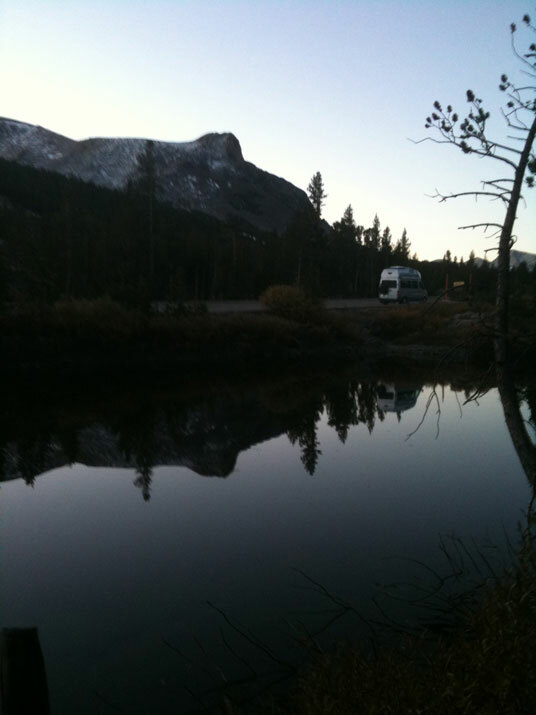 This was taken at dawn on avery cold fall morning at the top of the Tioga Pass just outside Yosemite National Park. Can you feel it? 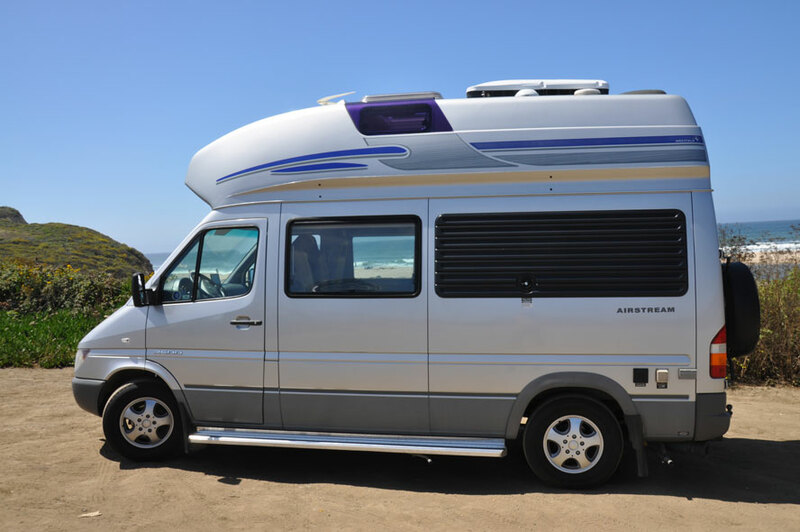 This Airstream Westfalia has everything you need, including superb fuel economy. On the road, I made 20 mpg, without sacrificing speed. It’s not a car, but cruising at 70 mph is fine most of the time. In the city, a little less, maybe 19 mpg. I have never towed anything, but Airstream says that the maximum tow weight is 5000 lbs and maximum hitch weight is 500 lbs. The cruise control is phenomenal. According to people on Yahoo’s Sprinter Groups, it is the most fuel efficient way to run the vehicle, and certainly changes down and revs up more intelligently than I can when going up the local hills. I have had a little maintenance done and, okay I admit it, a recent repair. The maintenance was the 30,000 mile service (last fall) and replacement of the coach batteries (last month). The repairs (this month) were a new air filter, fuel filter and turbo resonator. Another shot at the same place on the same morning. I didn’t take enough trips like this: management disapproved! But they were all great trips, even the one when I needed repairs. Another advantage of a smaller RV: you can drive all the way to Hetch-Hetchy reservoir, where wider rigs are refused access. Enjoyed that trip too! If you know these vehicles, you’ll have heard of the turbo resonator, which is considered by some a bit of a design defect. I’m no mechanic, far from it, but I kept this old part, and was astonished to discover that in a pressurized system it is held together by glue. That’s it, no bolts holding the two halves together, just glue! 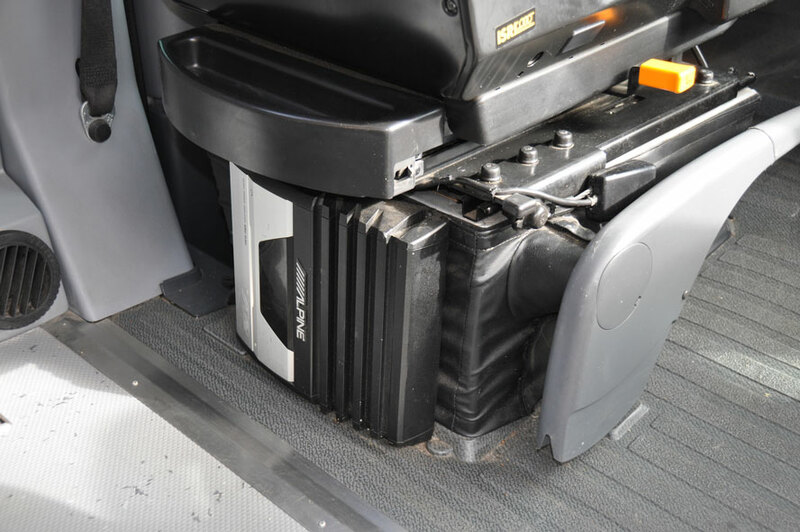 On Yahoo’s Sprinter Groups, several recommend replacing the part with a plain steel tube. At any rate, there’s a new one in there now. So there you have it, pretty much, the short, sad story of Cookie, the wonder RV, and me. May you write the next chapter!